I think my face is stuck in the "shock" position from my recent UFO discovery. lol You can read all about it here! Yes, I'm still plugging away! When I take up a quilting UFO, I wonder why I put the project aside. At other times, I know exactly why. When I picked up this wool UFO, I knew without a doubt why I pushed it aside. I have a personality conflict with the stem stitch! There, now I said it. Yes, sir! When it comes to doing the stem stitch, I just cannot seem to get the hang of it. Not sure why, it just didn't come easily for me. Hence the personality conflict. I knew that I couldn't keep the project folded there forever. So, personality conflict aside, I tackled it. 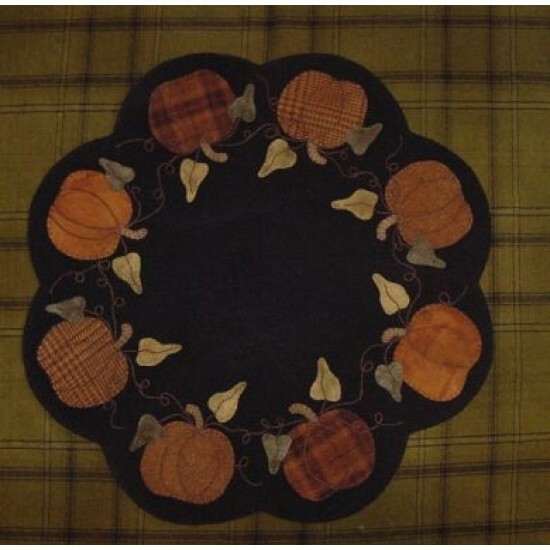 The pattern is called Pumpkin Table Mat by Lisa Bongean of Primitive Gatherings. The pumpkins and stems were the only things stitched. I tackled the leaves and then began dealing with this personality conflict. By the end of the last pumpkin, I think I worked it out! The original pattern did call for a loopy vine connecting all the pumpkins, but I chose otherwise. Here is the pattern picture so that you can see the difference. I like that my pumpkins are not connected to one another. Besides, I would have to do more stem stitch!!!!! Let's not push this girl to extreme! Thanks for stopping by! Catch you all later! Cheers! May cause one to reminiscent ... ! In my defense ... ! Under the Christmas Tree ... a tutorial ...! Happy Valentine's Day ... !